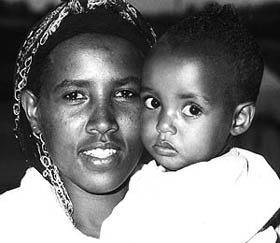 On this date, 27 years ago, a historic operation was conducted that brought over 8,000 Ethiopian Jews to Israel, to the place that had been the subject of their longing for so many years. In the 1970’s, the Israeli government made the decision to authorize the use of the IDF to enable the immigration of thousands of Jews who were living in Ethiopia, a country that at the time prohibited its citizens from emigrating to Israel. The operation was particularly challenging and risky especially since Ethiopia and Israel did not then have diplomatic relations. The operation consisted of Ethiopian Jews first reaching Sudan, then being transported by sea from there to Israel with help from the Israel Navy. Between 1977 and 1984, about 5,000 Ethiopian Jews reached Israel this way, until the IDF command decided that the transport posed too much of a risk for the new immigrants. In a secret cabinet meeting held on November 1984, it was decided to conduct a secret operation, held far from the public’s view, using an IDF airlift to bring Ethiopia’s Jews to Israel in a mission came to be known as Operation Moses. During the operation, over 8,000 Ethiopians Jews were safely brought to Israel, until its existence leaked to the international media, precipitating a political crisis in northeastern Africa. The thousands of Jews left in Ethiopia and Sudan found their way to Israel in subsequent operations such as the “Operation Joshua” and “Operation Solomon”. 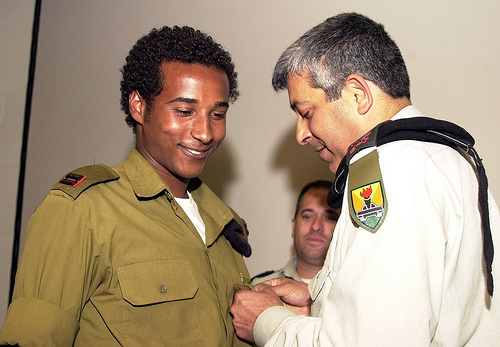 As of 2010, over 110,000 people of Ethiopian descent were living in Israel, with thousands of them joining the IDF every year. These soldiers serve in combat positions in every division of the IDF and many are selected for the prestigious officer’s course, after which they return to their units as commanders. That´s yet another glorious page in Israel´s history. Surely, this causes endless cognitive dissonance in Jew-haters all over the world. Which is just great! We can be really proud of Israel’s humanity and achievements. The picture of Israel painted in the Guardian is a travesty of the truth. While Israel’s neighbours are some of the most racist on the planet, Israel has created a true rainbow country. Better be careful, they might become a demographic threat soon. I am proud of Israel’s capability to absorb immigrants of all nationalities and colours and shades of belief. Compared with the Arab world she is light years ahead – we have only to think of how Arab countries treat their Muslim Palestinian brethren who are unfortunate enough not to live in Gaza in the luxury of Gaza city – but then she would be. Hehe, here is a typical example of what I said: a prototypical Jew-hater suffering cognitive dissonace. Fun to watch.